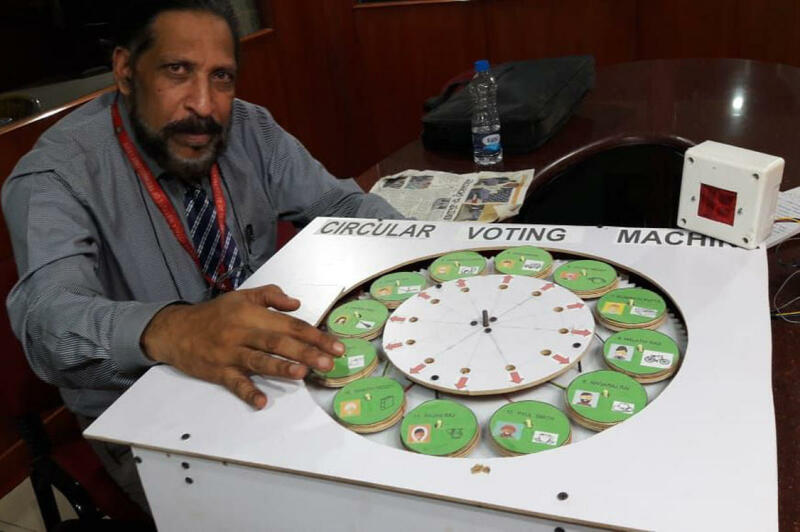 Bengaluru-based inventor Dinesh K Avnekar (62), director, R&D, Product Innovation Cell, Vijaya Vittala Institute of Technology, has developed a circular electronic voting machine. This is different from the rectangular one which resembles the traditional ballot paper. In the Avnekar machine, the names of candidates are not static. They rotate in a circular fashion on the circular board, after every voter casts his vote. This shuffle happens in just three seconds, giving the voter time to search for his candidate and check the others. “Research and studies have shown that candidates listed in the top three slots normally win the elections. This is because voters are not interested in going through the entire list. It has also been noted that supporters near booths influence voters by asking them to press the first or the second button. It has also been found that election officials posted at polling booths hurry voters because of the long queues. This is another reason why voters do not read the complete list. This circular machine eliminates all this,” he told DH. It took him four months and five failures to create it. He drew inspiration from the giant wheel at amusement parks. He has applied for a patent at the Indian Patent and Trade Mark office in Chennai and will demonstrate it to the Election Commission of India. He said that this is the first such machine in the country and cost him Rs 3,000 to make. “I am open to scrutiny and challenges. At present, the machine weighs around 5 kilos because it is made of wood and motors. I am working to make a lighter and compact one which will weigh one kilo, less than the existing one (1.5 kg). The machine is tamper-proof and safe,” he said. He has worked with Bangalore University Vice-chancellor Prof K R Venugopal for various patents. The duo has so far got 100 patents for their inventions. However, this circular voting machine is Avnekar’s own. He has independently got 15 US patents, too.